Produktinformationen "STRANGER THINGS 17,5 cm ELEVEN ACTIONFIGUR"
From McFarlane's Toys. One of 2016's most critically acclaimed television series, Stranger Things, is created, written, directed, and co-executive produced by The Duffer Brothers. The series chronicles what happens when a young boy vanishes, leaving the small town he's from to uncover a mystery involving secret experiments, terrifying supernatural forces and one strange little girl. This Eleven action figure features a spectacular likeness sculpted from images of actress Millie Bobby Brown. Figure comes with removable blonde wig, radio, and waffle, and is designed with over 12 points of articulation for dynamic posing options! 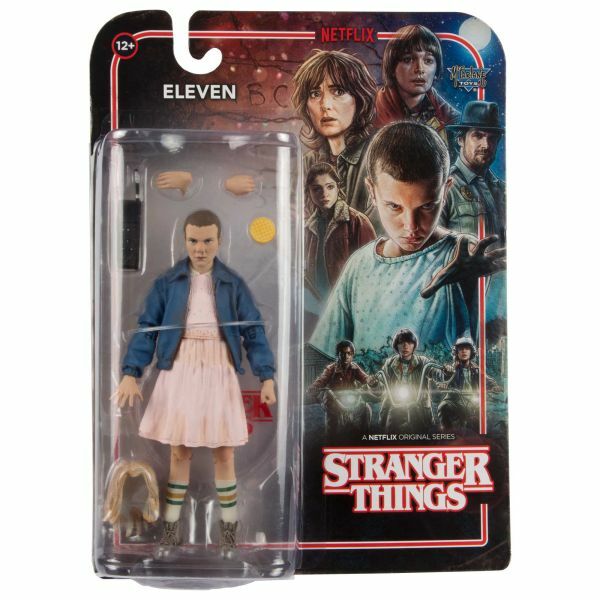 Eleven features a stylized Stranger Things branded display base and is showcased in retro themed packaging. Weiterführende Links zu "STRANGER THINGS 17,5 cm ELEVEN ACTIONFIGUR"
Kundenbewertungen für "STRANGER THINGS 17,5 cm ELEVEN ACTIONFIGUR"